BERLIN — Though it's only playing for pride with Bundesliga survival all but secure, Fortuna Duesseldorf could yet have a major say in whether Bayern Munich or Borussia Dortmund wins the title. 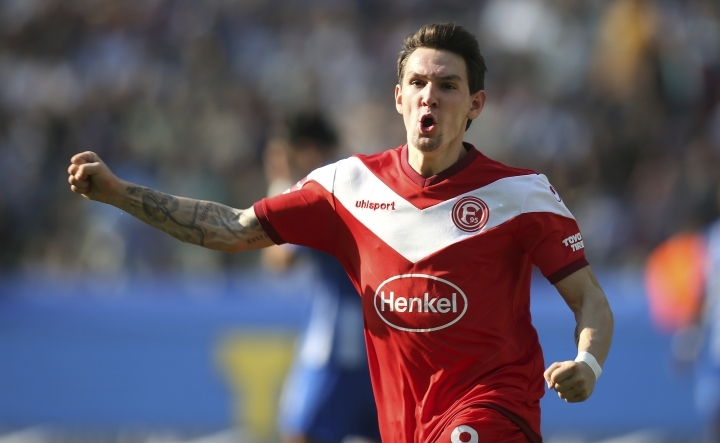 Duesseldorf took points off both opponents earlier in the season with a 3-3 draw in Munich and a 2-1 home win over Dortmund, and it plays both again in the final six weeks. Bayern, which humiliated Dortmund in a 5-0 rout to seize a one-point lead last weekend, travels to Duesseldorf on Sunday. "We've already shown (in) the away game that we can deliver a huge fight against Bayern," defender Matthias Zimmermann said. "We want put on a show for the fans at home. Perhaps Bayern will have another bad day." Most wrote Duesseldorf off on its return to the Bundesliga after it claimed just one win in its opening 10 games. After a 4-1 win over Hertha Berlin on Nov. 10, it claimed its 11th league win with a 2-1 victory in Berlin on Saturday. "I really have a brilliant troupe," coach Friedhelm Funkel said on Saturday. "Now I think I can say that we're assured of playing in the Bundesliga next season. No one would believe anything else I say anyway." Duesseldorf is comfortable in 10th, 16 points above Stuttgart in 16th, the relegation playoff spot. It has claimed 28 points from its last 14 games; only three other teams have done better. Although Duesseldorf doesn't boast any star names, it profits from a well-organized defense and clinical attack. It had just 40% possession against Hertha on Saturday yet took two more shots on goal, with Benito Raman grabbing both goals. Dodi Lukebakio scored a hat trick when Duesseldorf came back from two goals down to draw Bayern on Nov. 24. Four players will return from injury to face Bayern again on Sunday. Kaan Ayhan, Markus Suttner, Alfredo Morales and Dawid Kownacki will be back, but defender Niko Giesselmann will miss the game with a calf injury. Bayern, meanwhile, is full of confidence after its demonstration against Dortmund. "The players delivered a statement," Bayern sporting director Hasan Salihamidzic said. "That's the level at which they need to be measured." After Duesseldorf, Bayern, the six-time defending champion, faces Werder Bremen at home, Nuremberg away, Hannover at home and Leipzig away before ending the season at home to Eintracht Frankfurt. Dortmund hosts Mainz on Saturday, then faces Freiburg away, Schalke at home and Bremen away before welcoming Duesseldorf in the penultimate round and finishing at Borussia Moenchengladbach. The two rivals have exchanged the league lead between them five times already this season. "Anyone who's seen us knows that we don't want to give it away any more," Bayern defender Joshua Kimmich said.